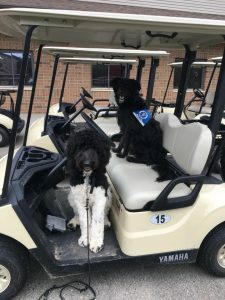 4th Annual Charity Golf Tournament | Deafinitely Dogs! Join Deafinitely Dogs! on Saturday, August 24th, 2019 for our 5th Annual Charity Golf Tournament at St. Andrews Golf Course in Cedar Rapids. Registration will begin at 7am, with golf beginning at 8am. The cost of the event is $70 – and that includes 18 holes, a golf cart and lunch. We also have prizes, raffles and silent auction items available! If you can’t make it to the event or don’t golf, consider sponsoring a veteran to golf for free! By paying their registration fee, you’re allowing them to have a fun day of golf at no cost to them.